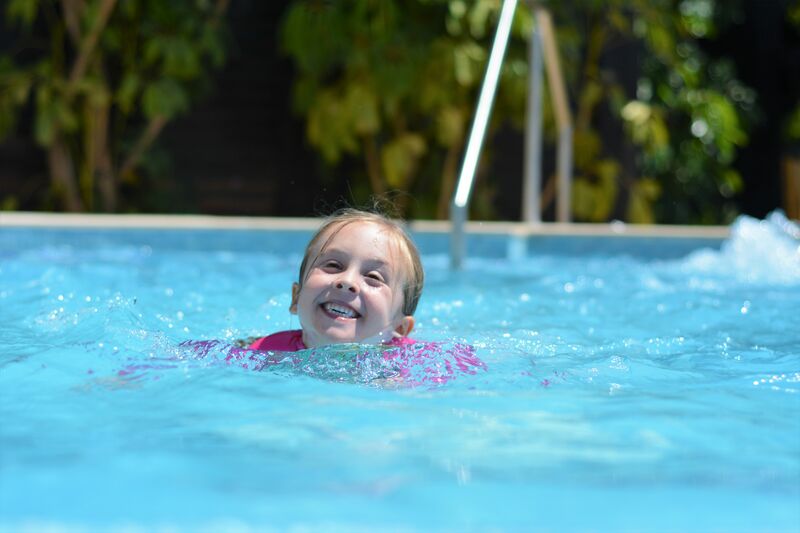 The sound of children laughing as the water splashes up at them, dripping slowly from their smiling faces, or catching the faces of their parents sat sunning themselves on the side of the pool. The lines around little eyes from goggles which are slightly too tight and pull their eyes back into a little squint as they try to explore the water underneath them. The underwater bubbles of movement in front of their eyes as they swim through legs and attempt hand stands whilst failing and landing with a splash on their backs. The noisy countdown of a line of children ready and eager to jump into the water together, one diving seamlessly and elegantly, one entering the clear blue liquid like a pencil disappearing completely under the water in a flash and another making as many waves as possible with an enthusiastic bomb. These are the kind of memories that are priceless in childhood and the kind that I assumed came so naturally to all children. Until I became a parent that is. Once I had Eva I knew I wanted her to be as confident in the water as she could be and that we actually needed to help her with that. Having grown up with a parent who couldn’t swim until way into her 30’s and not being the most water confident person myself, I mean I can do a pretty good hand stand but ask me to properly swim a length with much more gusto than a steady breaststroke and I am struggling from the off, I really wanted Eva’s start to swimming to be a different one. Due to her allergies and skin reactions though as a baby we were probably a little late in the day as we started taking her to water babies when she was about 8 months old. 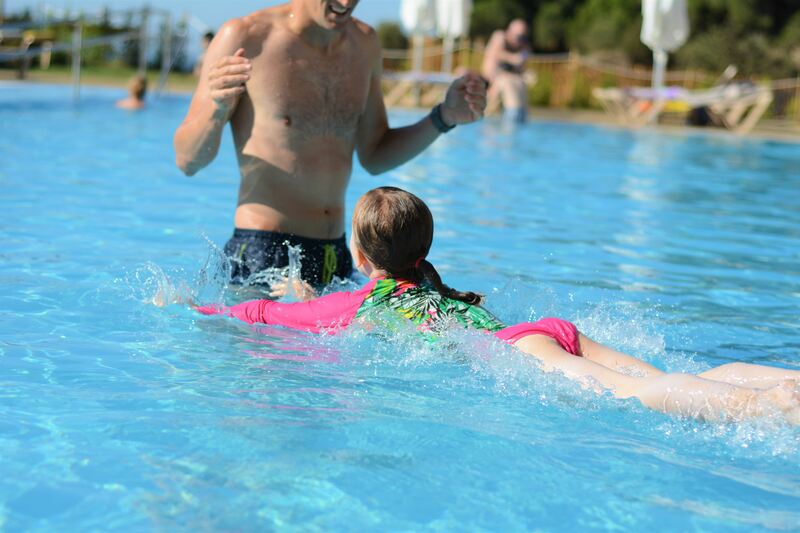 If you don’t know, water babies is like baby swimming lessons which focus on you teaching your children to swim and mostly about building confidence in the water. Eva did seem to love it, she almost always went in with Eddy and it was a lovely little bonding activity just for them. It did always seem a little struggle for her if I am honest and her skin suffered a bit so we decided after a couple of terms to stop. Over the years I have felt bad about that, we of course took her swimming in the local pool, we went on holidays and she was confident enough in the water but given her shy nature she would never venture that far from our arms and despite numerous attempts at teaching her ourselves and encouraging her to go to classes she was resistant. 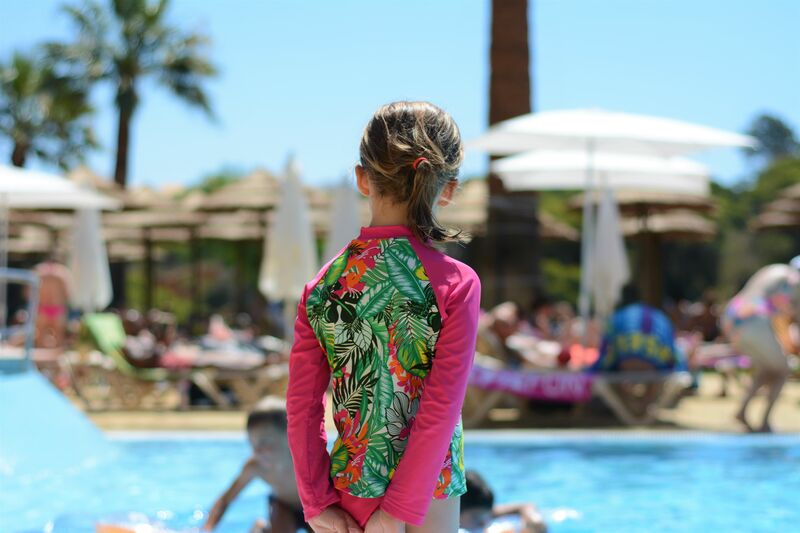 She wore a float vest which was brilliant for letting her feel confident in the water and when she outgrew that Eddy would take her with a noodle and practice. She does love swimming which I am thankful for I guess it was just a little concern of knowing how she would go from that to actually learning to swim. It turns out the answer (for us at least) was simply time. 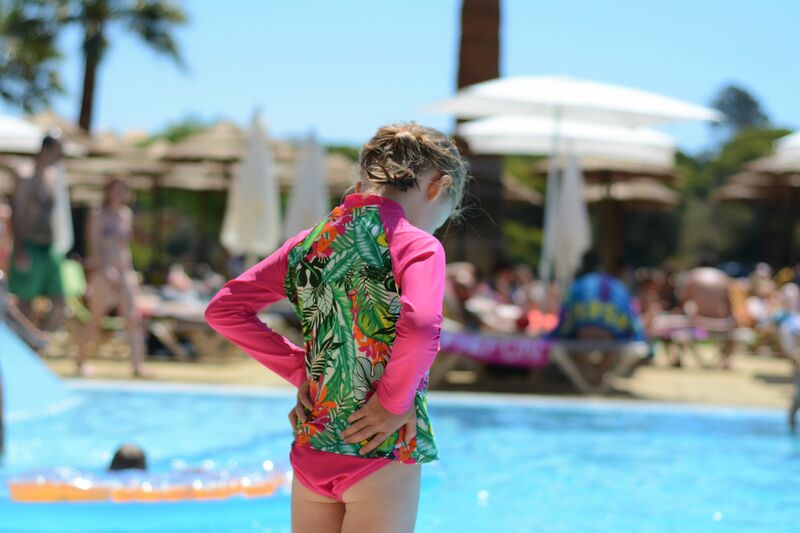 Just a few weeks ago before we went on holiday she was taken swimming by her grandparents and swam a little bit just by herself, without her noodle she just let go and went off swimming and was apparently so happy and a little surprised herself that she kept doing it, I am sure she did it just to see her proud grandparents faces and have them praise her efforts. As she walked back in the house beaming I have literally never been so proud. It was out of the blue for me, she had not been asked, or told, or even taught, that day she had just done it by herself and there is nothing better to me that her being proud of herself, and that she was. The only thing left, was for me to see it for myself, so it was kind of lucky that I got to witness it for two whole weeks!! 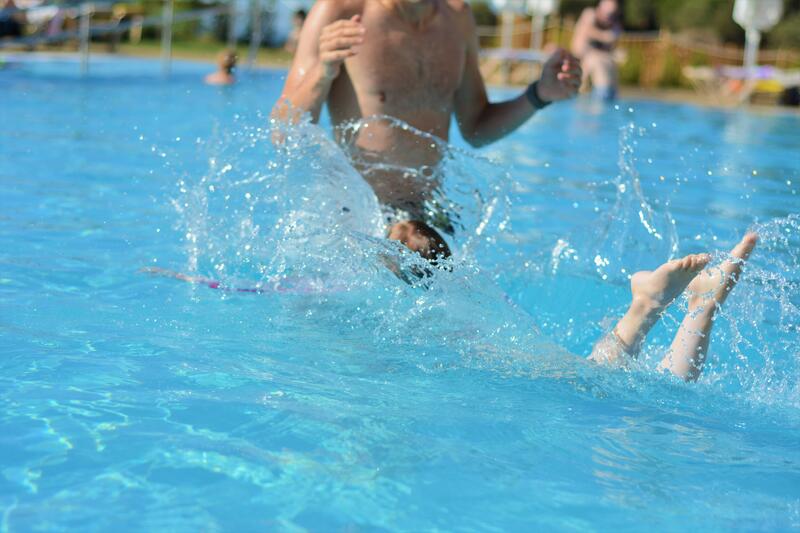 The first day we got to Portugal and she, without hesitation, without fear, walked into the pool and started to swim. I looked on amazed and shocked and so so happy I could have cried. She was beaming with happiness to show me her efforts and I didn’t care who was looking as I shouted and clapped at how wonderful this moment was. Yes she is 6 and a half and yes she is still shy and reserved, yes she still likes to be able to touch the floor and no she won’t be putting her head under the water or swimming for an Olympic team any time soon but she is happy and thriving and I for one (and Eddy for two!) are so proud to say now that she can swim! She has learnt to swim. I feel like she hasn’t just learnt to swim but she has learnt that she can do it. She can learn anything, do anything and that she just needs to give it time and a little bit of patience. She knows she was scared and that she thought she would never get there but get there she did. It has been the best two weeks watching as her confidence grew more and more, she wanted to show off, she was so excited to swim lengths and watching her arms reach high above her head and her long long legs kicking as fast as she could behind her to get her to the other side never ever got old. But the moment we swam along side one another for the very first time is something I don’t think I will ever forget, it was amazing and special and ordinary all rolled into one and I literally cannot wait to go swimming with her again. To make this pretty extraordinary moment, a very ordinary one for years and years to come. She is definitely getting there now!